King Porus (ca. 340-317 B.C.) - Hindu king of the Indian state of Paurava at the time of Alexander's invasion, Porus fought the Macedonians at the Battle of Hydaspes. His name is the Latinization of the Sanskrit, Purushottam. The name of his capital is not known, but is believed to have been located near the present city of Lahore. The oldest of the Vedas, the Rig-Veda mentions a Vedic tribe called the Puru, so Porus may very well have been descended from this tribe. 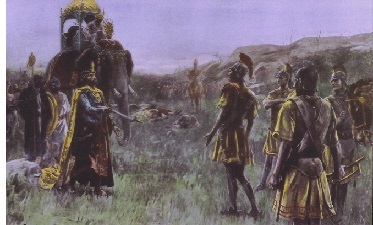 After Hydaspes, Alexander tried to gather intelligence about the neighboring Indian tribe, the Nanda. Porus described its king as a man of worthless character, not to be held in respect; so obviously there was tension between the two kingdoms. Ultimately, it made little difference because Porus' reign came near the end of the divided Mahajanapadas period. In eastern India, a new power was rising, the Mauryan. Within a few years, it would conquer the Nanda, and only six years after the Battle of the Hydaspes, the Maurya had overthrown Alexander's satrap in India, and absorbed it into their growing empire. Whether or not this was Porus is unknown. After Alexander's withdrawal from India, not much is known of him. It is said that he was assassinated sometime between 321 and 315 B.C.. So he may have been overthrown and executed or fled and assassinated at a later time.